How to Determine if an Egg is Fresh? Fill container with warm water, and put the egg in it. 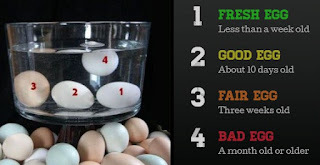 If the egg sinks flat to the bottom of the container, then it is fresh. If it floats, then it is not fresh. Take a look at the picture. It's so easy.